Reporting and updating Gohikealps from the trail in real time doesn’t seem to be as easy as I thought. On my main trip this summer I wanted to try and although not failing miserably, I’m finding that finding the time to do this properly is difficult. Posting random photos to Facebook is easy enough but actually writing something worthy of publishing is not. I’m sitting in a hotel room in St.Anton, Austria, writing this on my tablet. It’s pouring down rain and I’ve just spent a leisurely day here waiting out some bad weather and relaxing after walking here from Oberstdorf, Germany. Tomorrow morning I plan to take the first lift up to save myself a kilometer of vertical and hit the Lechtaler Höhenweg. I should emerge in Imst four days later but that will require some serious effort with 7,5-8,5 days of walking in serious Alpine terrain with a way too heavy backpack on my back. And the weather conditions don’t look great, there’s rain and thunder in the forecast for every day. I’m going anyway. Real Time Reporting, You Say? I wanted to try if I could update my site while on the trail. I’m in the Alps for 8 days + 2 travel days and my plan was to get on the Lechtaler Höhenweg. In preparation and sort of warming up for the Lechtaler Höhenweg, my good friend joined me to do a 3 day walk from Oberstdorf in Germany to St. Anton in Austria. My big idea was that I would keep a travel journal of sorts and update it every day. 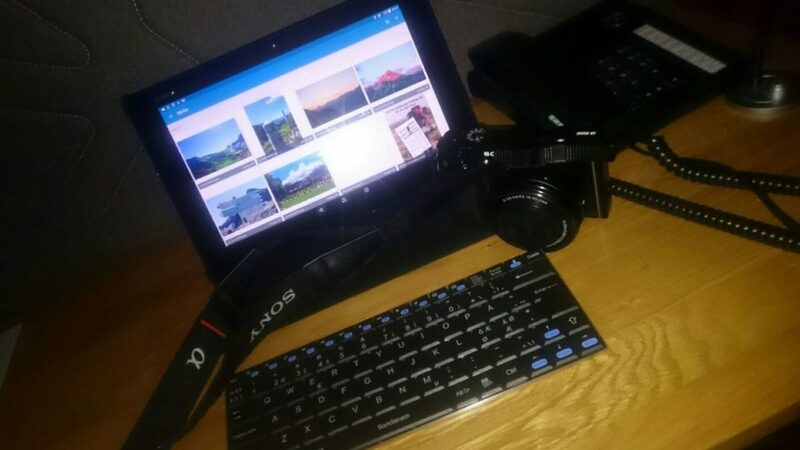 For this I brought along my Sony Xpeeria Z2 Tablet, my Sony A6000 camera and even a tiny external bluetooth keyboard since I just can’t type productively on a touch screen. The camera I always have with me anyway but the tablet I’ve never had before. I also have a cell phone, of course, with which I can get an internet connection if there’s no Wi-Fi. I got a USB charger that can charge all three at the same time. The camera and the tablet work together via Sony software and I can transfer images direct between the two. I have the camera set to shoot RAW+JPG images, so I’ll have the RAW for working on them back home and the JPG’s I can use right away. This works ok.
What doesn’t work as smoothly as I though is the Lightroom app for Android. I use Lightroom for all my photo editing on a laptop so hopes were high when I got the app for Android. It does a good job of actually editing the photos, colors and so on. It doesn’t do a great job with things that matter for updating this post, for example: image size. I ended up using Pixlr Express for the photos in this article. Not even sure where it came from but it worked better for this. So, I’m feeling like an amateur in this. I sort of have the tools in place and this article is evidence that this works, but for sure this is not as convenient as I thought. I’ll need to look at the software side of my tools again. Without the external keyboard this artivle would not have been written, by the way. That’s how much it helped. As far as the extra weight – not too bad. For a 10 day trip my backpack is crazy heavy anyway and being away for that long, the tablet & the keyboard are actually pretty useful for keeping in touch with the world. So the Gear’s OK, What’s the Problem? The problem so far on this trip has quite simply been not finding the time to write. Seriously. On our way from Oberstdorf to St. Anton we spent very long days walking and afterwards getting food and drink felt more important than starting to write something immediately. Now that I’ve spent the entire day relaxing, writing something in the evening is fine. Had I walked all day which I would have done, if not for the weather and general laziness, this would not have been written. With the gear everything is slower and the end result is maybe not as good. That’s a little discouraging, too, but I think it’s really more about the mindset. Posting pics on Facebook is easy enough but writing takes time regardless of where you are. If the evening looks like the photo below, your tablet and keyboard are pretty low on your immediate priority list. And what a walk it was! 3 days of sunshine and the full variety of everything: staying in Alpine towns and mountain huts, enjoying excellent meals with good wine in addition to sweating and swearing in pain on the trail. We wanted to walk from Oberstdorf to St. Anton which both have easy train connections to Munich, and we did. We flew in to Munich and took a train to Oberstdorf. We spent a nice evening in Oberstdorf before hitting the trail. 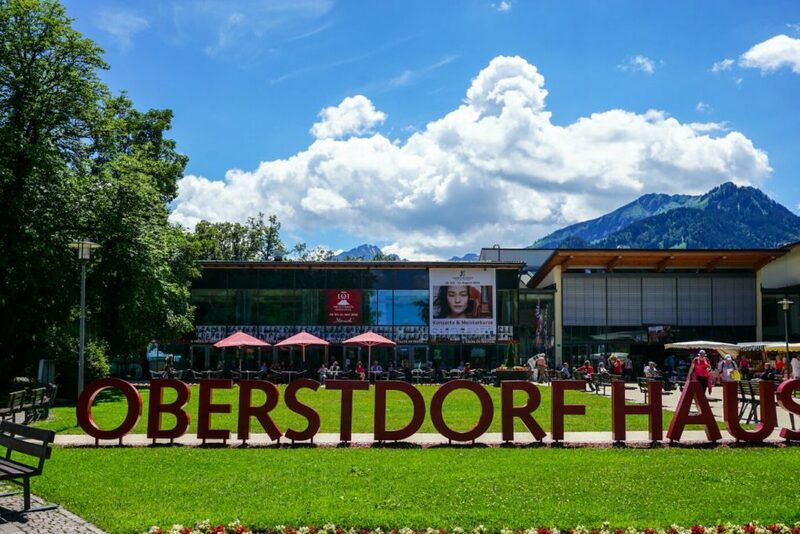 Oberstdorf is one of the southernmost towns, if not the, in Germany. A good base for all kinds of mountain activities and the train makes it very easy to reach. In the morning, we took a bus to the Söllereckbahn, near Oberstdorf, and started walking. Our first destination was Fellhorn. Fellhorn was full of tourists so after a quick break we continued on to the Krumbacher Höhenweg which lead us to the Fidererhütte. We had an excellent, late lunch there and had serious thoughts of just staying there. After being re-energized by an awesome Gröstl, we decided to continue on to Mindelheimer Hütte, our destination for the day. Mindelheimer Hütte was very crowded. We got a very nice dinner and a hot shower. We spent the night in a room with 10 other people, in relative comfort. If you’re not used to this type of accommodation, it may not be comfortable. Earplugs help. The next morning we continued towards Lech, a famous ritzy ski resort town in Austria. On the way is Warth, which was to be our lunch break. It took much longer than we had thought to get there, and we also made a small navigational error which set us back at least an hour. In Warth, after having lunch we agreed that walking from there to Lech just wasn’t worth it. We took a bus. In Lech we settled at Pfefferkorn’s Hotel and made good use of their spa. A wonderful dinner and a good night sleep in a private room helped us regain our strenght. 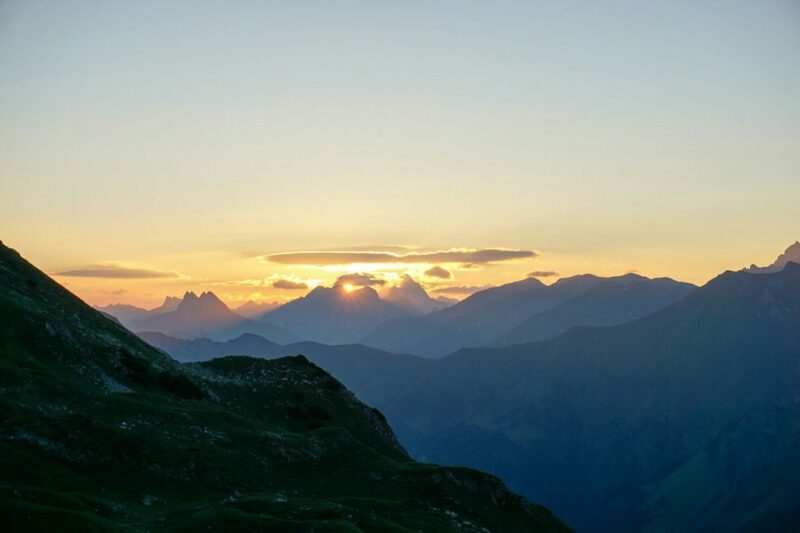 The lack of proper sleep in a mountain hut and the drain it causes to your energy levels is something to consider. The next day we aimed at St. Anton, and especially going up to the Valluga and taking a lift down from there. Otherwise this would have been too long a day. Wanting to again save some time and energy, we went up the Rufikopfbahn from Lech. From there we walked to Stuttgarter Hütte for lunch. Then it was on to the mighty Valluga. The path was trickier than before and we knew that the climb t othe Valluga would be tricky. It was. It really is something for experienced folks, as it was very steep and with all the loose rocks somewhat dangerous. We made it up to find that the final ascent to the top station at Valluga was closed due to construction work. Had we been there 10 minutes later, we would have been stuck on the Valluga. We got up there just in time that the guys working at the construction site noticed us and held the lift for us. They helped us with ropes and cables so we made it up across the construction site. There was no time for thinking about the real danger present but we were counting our blessings on the lift down to St. Anton. So, to end the story. It’s now late in St. Anton and tomorrow I’ll be on my way to the Lechtal Höhenweg. I’m hoping for reasonable weather. I’ll be writing up this stuff when I get back home and will update on the trail if possible. It seems to me that it’s just easiest to post progress on a trip like this to Facebook or Twitter. No need to write as much and photos do the talking. 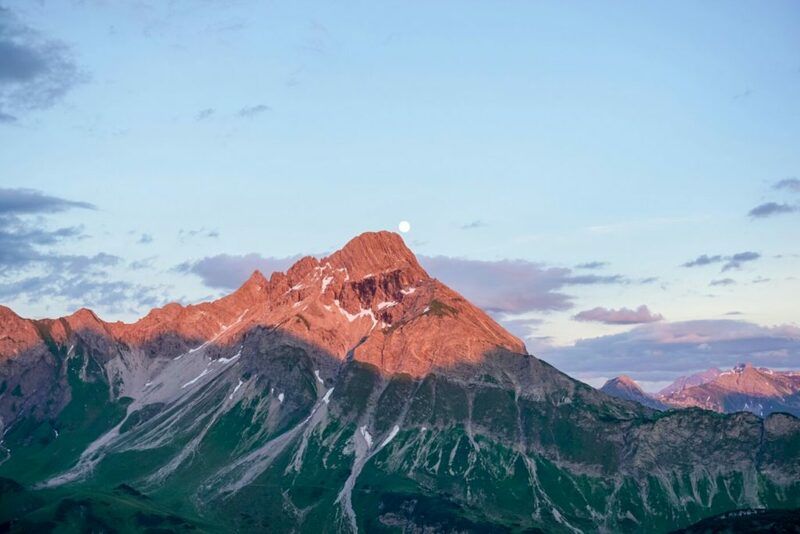 If you’re interested, do follow Gohikealps!